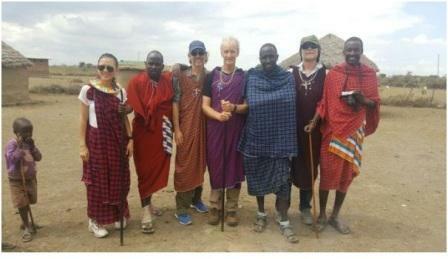 Five intrepid CM hikers flew to Africa in early June, four from Chiang Mai via Addis Ababa (Peter and Koy T., Mike the Hike and Irish Brian), the fifth (Peter D) from Hungary via Istanbul, all keen to climb the tallest freestanding mountain in the world: Kilimanjaro. The group’s base was the Keys Hotel in Moshi, a Tanzanian town lying in the southern foothills of the volcano. The initial step was to meet with our Top Climbers company representatives to discuss logistics, and to assess what additional clothing items would be needed. Sixteen porters were assigned to us, plus three guides (The Crew). The porters comprised basic carriers, tent-man, cook, dunny (toilet) man and waiter. Porters were not allowed to heft more than 20 kilograms, but In the case of Khun Koy’s luggage, an exception was made, once Arthur one of our guides, was persuaded that she really did need everything. 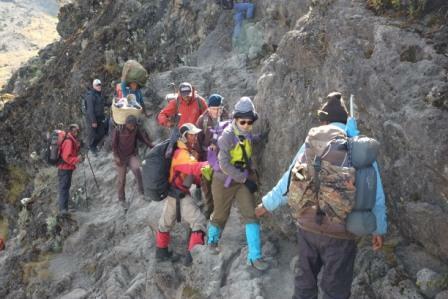 Although we paid a tour fee initially, the practice of tipping guides and porters would apply at the end of the trek. Individual tips would be proffered at the discretion of the group, with reference to recommended rates. 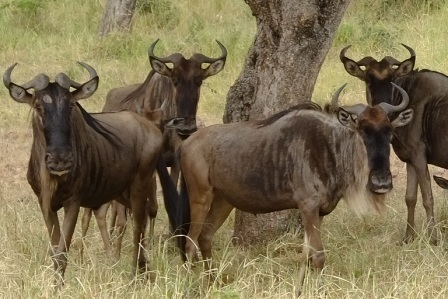 The cost of the tour (not including airfares and tips, but including one week Safari also) was under $3000. 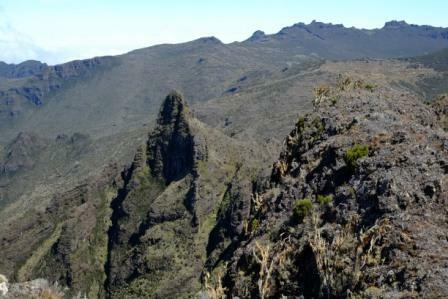 There are six main routes to the summit, Uhuru Peak, with variations within them. The trail the group chose was the Lemosho route – a total distance of 70 kilometers over eight days, sufficient time, as it transpired, to acclimatize to the altitude. The first six days would be spent hiking from camp to camp, ascending all the while through three distinct vegetation zones over a distance of 40 kilometers. 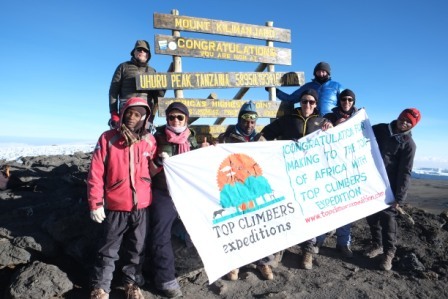 The seventh day, the climax of the whole trek, would see the group tackle Uhuru Peak at 5895 metres, commencing from base camp at 4673 metres, and afterwards descending to the final campsite at 3100 metres, by any standard, a huge day of hiking. 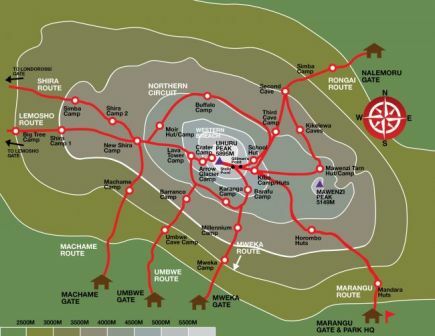 The eighth day would be descending 1500 meters to the Park gate, the tour bus and back to the hotel in Moshi. 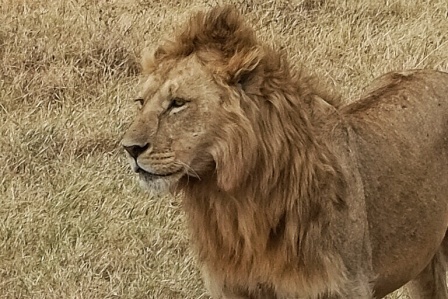 The one week Safari provided by Top Climbers comprised the itinerary in the Appendix. 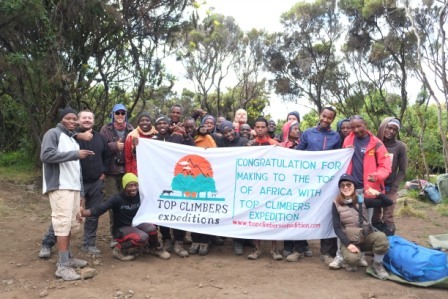 We were taken to the Top Climbers Expedition headquarters in Moshi early in the morning. 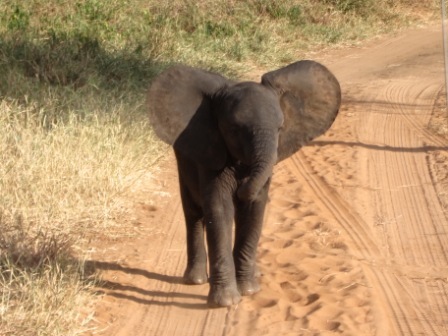 Here we were introduced to our guides and porters. 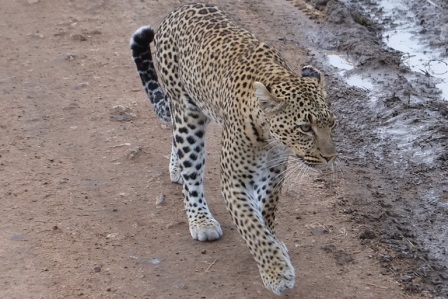 A total of 25 people in one vehicle headed out on the four hour trip from Moshi to the Londorossi gate of Kilimanjaro National Park. After signing in we received a picnic lunch box each, and then motored for a further ten kilometers within the Park to the hike start. A large section of this part of the Park had been given over to rubber plantation and pine plantation. On our way we saw a troupe of Black and White Colobus monkeys in the forest trees. We set off on foot from 2380m, to our first campsite – Forest Camp – six kilometers away at 2900m through tropical rain forest, small rucksacks on our backs … porters, with much larger bags, easily overtook us in order to establish camp and prepare our meal before our arrival that evening. We were told by our guides to go ‘Pole-Pole’, Swahili for ‘slow’; this would become the mantra for the remainder of the trek. Resident Blue Monkeys took up position in the trees above our tents and spied on us. Our three tents appear in the foreground of the photo below. The first evening meal of the trek was spaghetti bolognaise, and really good, indeed, every meal cooked by TCE’s stomach engineer, Chinga, was good. We had our own personal waiter too, Joseph, who performed his work to perfection. Overall we were under the distinct impression that we were to be treated as if we were royalty. After supper we had our pulse rate and oxygen levels measured – something that would be a nightly routine from this point on, in part to monitor our well-being. On our second day, after a filling cooked breakfast, we set off for Shira I camp at 3505m, a distance of 8km walking. The vegetation changed dramatically during the day from beard lichen-clad forest initially, to stream-dissected heather-dominated moorland. There was very little shade on the moorland under clear-blue skies. 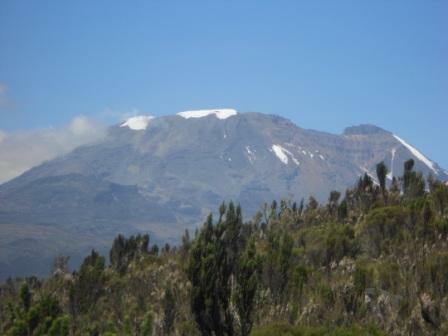 The view of Kilimanjaro top from the plateau was amazing. On our third day we headed towards Moir Hut at 4200m covering 14 kilometers distance. Much of the route threaded across bleak tussock-grass and scrub-filled moorland that formed the surface of the Shira plateau, a half million-year old filled caldera created by the collapse of the original Shira volcano. We took a detour to reach and scale the rim of the caldera crater. The view from the ridge was incredible looking down upon a sea of cotton-wool clouds far below. From the highest point on the rim we viewed an unusual rocky outcrop feature known as the Cathedral, pictured below. On our fourth day we headed towards Barranco Camp, a distance of 7 kilometers, via Lava Tower (also known as the Shark’s Tooth) at 4600m. This height proved to be a brief but good test of our ability to cope with increased altitude. By this time, the moorland vegetation had largely been replaced by alpine desert, and minimal vegetation. The trail from the Lava Tower led straight down to Barranco Camp, roughly 90m below the height of our previous Moir Hut camp. 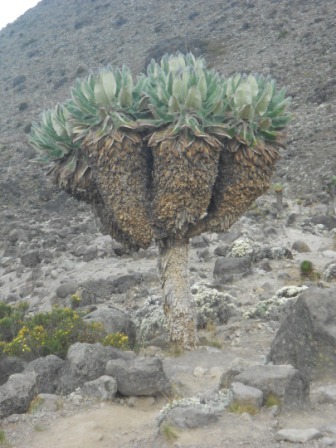 The trail passed through a grove of remarkable Dendrosenecio kilimanjari trees, a member of the groundsel family and unique to the higher elevations of Kilimanjaro. Barranco was located in one of the more impressive campsites, placed under the Arrow Glacier immediately beneath Uhuru Peak. Looking out in the opposite direction at dusk, one could make out the lights of Moshi town, way below. Directly facing the campsite was the infamous Barranco Wall, a natural barrier that had to be crossed by foot on the way to the next campsite the next day. 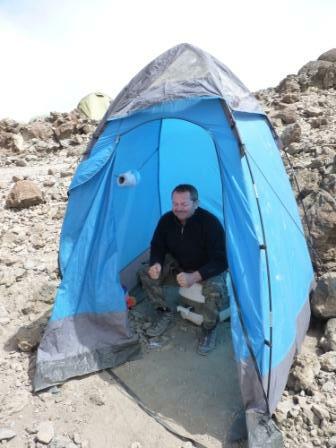 Incidentally, we had our own personal toilet tent; the photo below shows Bryan demonstrating how it was used. On our fifth day we headed towards Karanga Valley via Barranco Wall. This was a relatively short walk of 5km. For a second day in a row with afternoons largely free, we continued to acclimatise to altitudes of around 4000m and more. Barranco Wall lived up to expectations, and demanded a wing and a prayer at several points for the more faint-hearted members of the group. Trekking poles had to be secured in our rucksacks to enable full use of hands to manoeuvre around protruding rocks close to near-vertical drops. On our sixth day we headed towards Barafu Camp at 4663m. This again was a very short walk, but this time with significant height gain. As we approached the Camp we noticed a hiker being escorted back down the mountain, apparently suffering from altitude sickness. He was clearly unable to walk properly. 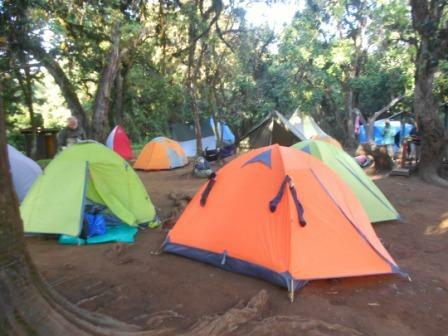 Barafu Camp was to be our base camp prior to the attempt on the summit. We were advised to rest during the afternoon, have supper, and then try to get some sleep before our alarm call at 11pm that evening. Our seventh day in the mountains began at midnight. We had a seven-hour trek ahead of us beginning in sub-zero temperatures under starry skies. The ascent, sometimes on rock, sometimes on scree, wended its way steeply and inexorably uphill. A train of people could be discerned like fireflies both below us and in front of us, their head torches glowing as they walked up the spine of the climb. On approaching Stella Point close to the rim of the crater at 5669m, the sky to the east became twilight and a pronounced zodiacal light rose pyramid-like above the eastern horizon. From this point, the sky became increasingly bright with blindingly brilliant red and yellow colours heralding sunrise. The sun broke onto the horizon just as we reached the crater rim. Immediately to the west stood the impressive Rebmann Glacier; on the eastern rim of the crater, lay the Ratzel Glacier. A further trek of 200m vertical ascent, heading north-west took us up along the edge of the crater rim and across a frozen-melted-re-frozen ice sheet connecting downwards to the Rebmann Glacier. Eventually we made it to Uhuru Peak. As we ascended this last portion of the climb, we passed a girl vomiting due to altitude sickness. Exhilarated by our achievement, we basked for a few minutes in the warm rays of the early morning sunshine whilst taking in the 360° panorama above the volcano’s crater and glaciers. Although only 7am, we still had a large distance to walk back down, so we made haste to descend. 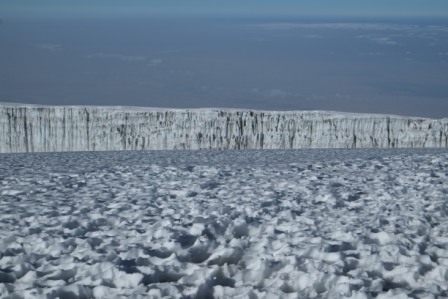 Two of the group decided to use scree slopes, running down and reaching Barafu campsite within two hours; this activity inevitably took its toll on quadriceps. 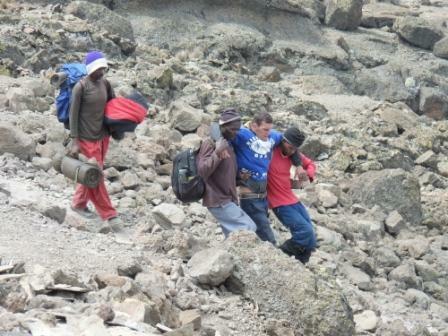 On the way down, we encountered a New Zealand trekker who had fallen and broken a leg. 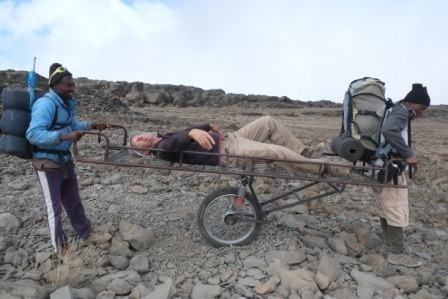 He was awaiting assistance to manually carry him all the way down the mountain – a distance of 12km to Mweka Camp – in transport similar to that pictured below. As we approached Barafu, Joseph (our waiter) and Ulah (tent man) climbed one kilometre up the mountain to meet us armed with orange juice and mugs – a very kind gesture! We regrouped at Barafu Camp for lunch, and enjoyed an hour’s break before continuing the long descent down to Mweka Camp at 3048m. The path was very rocky and stepped, so after all the effort that we had already expended, it was by no means easy. 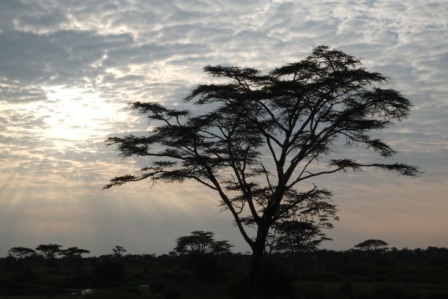 Mweka is situated in the upper forest of Erica trees and scrub. On our eighth day we descended a further 10km to Mweka Gate at 1650m, and to waiting transport to take us back to Moshi town. Soon after Mweka Camp, the vegetation zone changed to rain forest once more, and within the forest, we saw Colobus monkey and Blue Monkey troupes together in the tree tops. 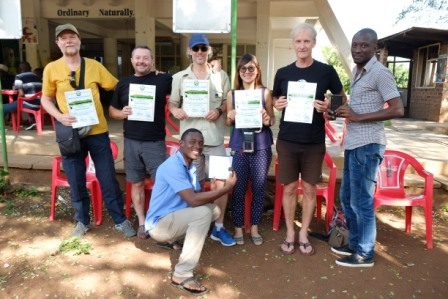 At the Gate, we picked up our certificates evidencing our ascent of Kilimanjaro summit. We headed back to the Top Climbers Expedition HQ to witness and participate in the tipping ceremony. We handed over the tip-monies to the trek leader who then doled out prescribed amounts to the individual members of The Crew. Curious? Who were the brave soles who ran down the scree slope? Likely, Mr. Davey one of them. Nice report. Did you experience lions licking dew off your tents? Ha ha, that should have been souls! Excellent description and pictures! Extraordinary challenging hike… Congratulations to all!